Barcelona have reportedly paid out a further €5m to Borussia Dortmund for Ousmane Dembele as part of the deal to sign him last year. As noted by BBC Sport, the French international joined Barcelona in a deal worth an initial £96.8m, but with the total expected to rise up to £135.5m. In turn, that means the Catalan giants have various add-on bonuses to pay out to the Bundesliga outfit in the coming years, and they’ve had to hand over an additional €5m this week. 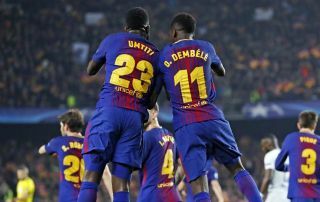 As reported by Mundo Deportivo, Barcelona have paid the €5m after Dembele made his 25th appearance for the club as he continues to put an injury-plagued first year at the Nou Camp behind him to try and establish himself in Ernesto Valverde’s starting line-up. Things have started well for the 21-year-old as he scored a sensational goal in the Spanish Super Cup to help win it for Barcelona, before starting their first La Liga game of the season against Alaves at the weekend. The reigning Spanish champions will hope that he can now kick on and prove his worth at the Nou Camp moving forward, as they will potentially still pay out a further €30m as part of the deal with Dortmund, as per Mundo Deportivo, and will want to enjoy as much success as possible to go along with their investment. Nevertheless, Dembele does face additional competition for places this year after the summer signing of Malcom, and so he’ll have to continue to impress to keep his place in the line-up with Barca looking to compete on multiple fronts this year.